Nepal's King Gyanendra has vowed to restore democracy to the country following weeks of violent protests. In a televised address he called on opposition parties to put forward their candidate for prime minister. They are expected to meet on Saturday but their initial reaction has been that the king has not gone far enough. The king has ruled directly since he sacked the government in 2005 saying politicians had failed to tackle the Maoist insurgency. The BBC's Charles Haviland in Kathmandu says the king's concession - on the 16th day of protests against his direct rule - is a significant climb-down. It was welcomed as a positive step by India, the EU and the US - but members of Nepal's seven-party opposition alliance say the offer does not mention the formation of a constituent assembly. Such an assembly could determine the future role of the king. Looking tense during his address on Friday, the beleaguered monarch said: "Executive power of the kingdom of Nepal, which was in our safekeeping, shall from this day be returned to the people." He called on the opposition alliance to recommend a name for prime minister as soon as possible. Until a new prime minister was appointed, the present government would continue, he said. The king called for elections but gave no date when they would be held. The opposition alliance is expected to meet on Saturday but spokesmen for three of the parties have already said the king's offer does not go far enough. Leader of Nepali Congress (Democratic) Minendra Rijal said there was "no mention" of the constituent assembly. He said it appeared the king still wanted to be "in the driving seat". Narayan Man Bijukchhe, chairman of Nepal Workers and Peasants' Party, said: "We did not conduct this movement to recommend the name of the prime minister to the king." Analysts say that while the alliance has remained united in opposition to the king, the parties that constitute it have been bitterly divided in the past and, even if they wanted to, they might be unable to find an acceptable candidate for prime minister. The reaction on the streets was more forceful. 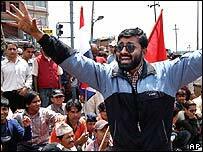 Protester Grihendra Shrestha said: "We have won the battle, but we still must win the war." "I want full democracy, all the power with the people," said Lekha Nath Bhatta. India, which holds considerable influence over its neighbour, said the king's move "should now pave the way for the restoration of political stability and economic recovery". The EU also welcomed the move, saying it hoped it would "open the path to a peaceful process in Nepal". US state department spokesman Sean McCormack said: "We expect the king to live up to his words... We urge the parties to respond quickly by choosing a prime minister." Tens of thousands of people had returned to the streets in Nepal's capital for a second day of mass protests on Friday, despite a shoot-on-sight curfew. The renewed curfew began at 0900 (0315 GMT) and ran through to midnight (1815 GMT). On Thursday, three people died in one area of Kathmandu when police opened fire on the crowds. At least 14 demonstrators have now died around the country in the past two weeks.